There were 464 press releases posted in the last 24 hours and 153,487 in the last 365 days. 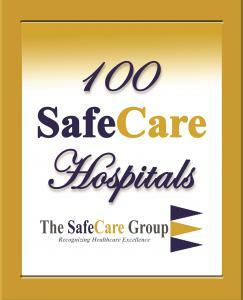 LEXINGTON, KENTUCKY, USA, July 19, 2018 /EINPresswire.com/ -- The SafeCare Group® successfully protected its intellectual property rights by formally applying for and receiving Registered Trademark Status for its 100 SafeCare Hospitals® as Recognizing Healthcare Excellence®. The 100 SafeCare Hospitals® brand has become synonymous for Recognizing Healthcare Excellence® from its holistic, evidence-based metrics that reflect a balanced scorecard of healthcare excellence. Recognizing Healthcare Excellence® refer to 100 SafeCare Hospitals that excel in evidence-based metrics of low infections, low complications, low readmissions, high patient satisfaction, and high value of care. The top 50 hospitals represent the top 1% performance in the evidence-based metrics of HVBP, HACRP, and HRRP, and only about 2% percent of US hospitals earn the prestigious 100 SafeCare Hospitals® distinction. •	December 2017 - To commemorate 100 SafeCare Hospitals 5th anniversary, The SafeCare Group has released a celebratory logo to be used in conjunction with the standard product badge. •	January 2018 – Release fifth annual listing with rankings. 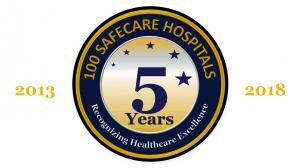 The SafeCare Group was founded in 2010 and its motto is “Innovating, Disrupting, Transforming” healthcare. The SafeCare Group SaaS solutions known as SafeCareSoft® enable hospitals to take advantage of disruptive healthcare software that optimize hospital reimbursement and accreditation. Since 2012, SafeCare Analytics® have been helping hospitals excel with physician privileging software for Joint Commission OPPE, and hospital software for better readmissions, complications, infections, and value. Since 2013, 100 SafeCare Hospitals® listings have been Recognizing Healthcare Excellence® of 100 US hospitals that excelled with low infections, readmissions, and complications. Since 2015, SafeCare® magazine has been delivering information on the people, ideas and novel technologies affecting access, cost, and quality of healthcare across the globe.